Typically, it’s the school bully forcing people to fork over their lunch money, but in one particular case it’s the school itself. 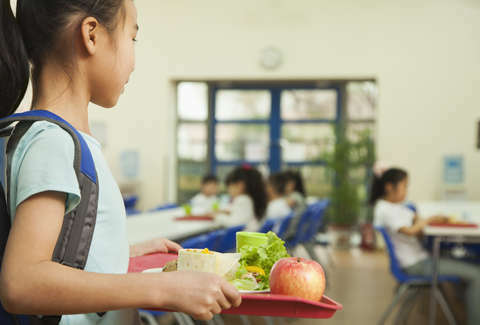 Administrators at The Cranston School District in Rhode Island hired a collections agency to go after people with unpaid balances on lunch accounts. The district has struggled to bring delinquent lunch accounts current in the past, writing off nearly $100,000 between September 2016 and June 2018 (that’s a whole lot of mystery meat), NBC 10 reported. This academic year alone, The Cranston Schools racked up about $45,000 in school lunch-related debt. Students -- who pay between $2.50 and $3.25 for lunch each day -- continue to run up their accounts, and the district is ready for their parents to pony up the cash they’re owed. The Providence Journal reported that the agency will be going after parents for as little as $20 beginning January 2, 2019. A representative for the school district told the NBC news affiliate Transworld Systems will be taking a “soft approach” to tracking down the late lunch money, sending requests via mail rather than pestering parents via phone call. How kind of them! The Cranston Schools’ chief operating officer, Raymond L. Votto Jr, sent a letter of his own to parents explaining that “the district lunch program cannot continue to lose revenue.” He said the collections agency shakedown was a last ditch effort after trying to collect themselves “without much success.” He added, however, that no student will be denied a meal so long as they need it, however, so they’re not totally heartless. “Obviously we continue to feed our kids no matter what the balances are,” he said. Students with delinquent accounts won't get different meals than those who are all paid up either, though it’s an approach The Cranston Schools have (unsuccessfully) tried in the past. Students who owed money were once given a sunny butter sandwich, fruit, and milk, but the school district gave up on that when they realized it wasn’t getting lunch bills paid any faster. Parents in the area can see both sides of the coin. Lori Clemens, whose grandson attends a Cranston-area school, said she understands that the school wants it’s money, but was empathetic to parents unable to pay. “Yeah, $45,000 is a lot of money for the school district to not have, but then on the other hand I know what it’s like not to have enough money,” she said. Clearly this issue is bigger than unpaid lunch money.